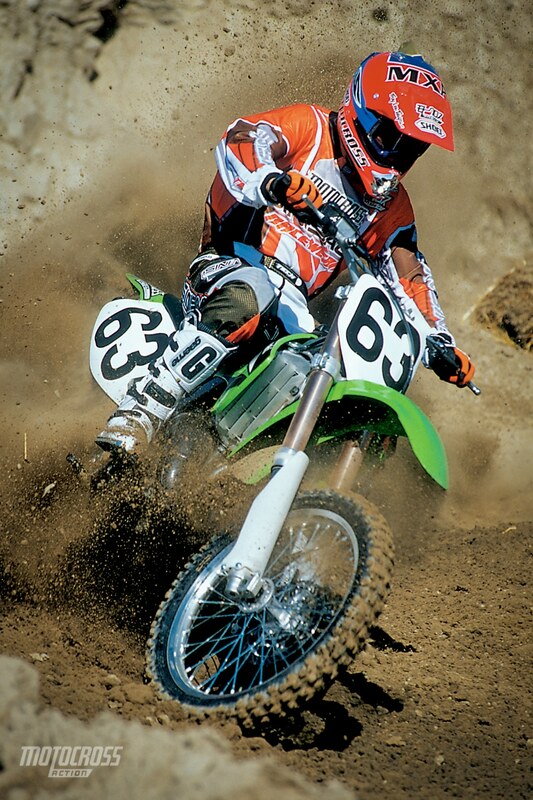 This test of the 2004 Kawasaki KX125 was featured in the November issue of MXA. 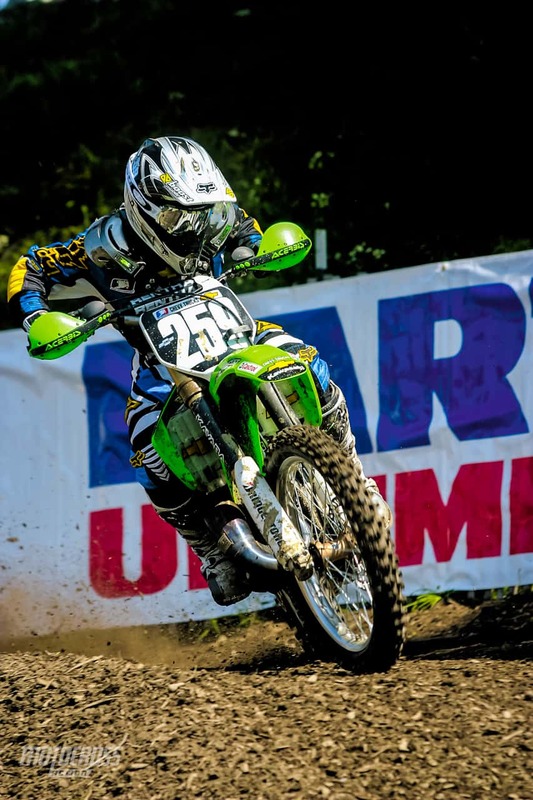 We hate to burst anyone’s bubble, but Ryno Hughes, Grant Langston, Mike Brown, Brock Sellards and Branden Jessemen should count their lucky stars that James Stewart is on a 2003 Kawasaki KX125 instead of a 2004 model. Not that Bubba seems to need any help, but the ’04 KX125 has taken a quantum leap forward over the bike James is riding now. How so? On the dyno, it pumps out close to 35 horses. Last year it didn’t break 32. That’s huge. More like incredible! Okay, Stewart doesn’t need any help, he’s waxing, polishing and buffing the competition on his 2003, but wouldn’t you like a little help? Thought so. James Stewart was head over heals faster than the competition in 2004 on his KX125. The question at hand for the MXA wrecking crew was whether the KX125’s sudden reversal of fortune in the dyno room translates to the race track. We’ve seen a lot of dyno queens that couldn’t get out of their own way when the rubber met the road. Where would the 2004 KX125 fall? Dyno Queen or Duke of Dirt? Q: CAN A KAWASAKI KX125 ACTUALLY MAKE 35 HORSEPOWER? A: Kawasaki‘s sudden surge on the dyno is impressive, but where did it come from. 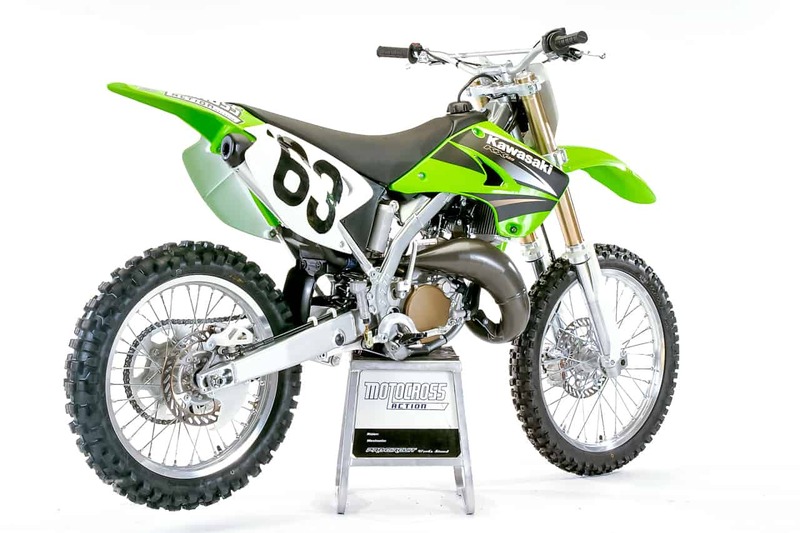 Last year MXA had a full-race KX125 that made the same numbers as the stock 2004 KX125, but it was ported, piped, milled and fueled (with $8 a gallon race gas). For 2004 we got the same numbers off the showroom floor (using $2 a gallon 91 octane pump gas). 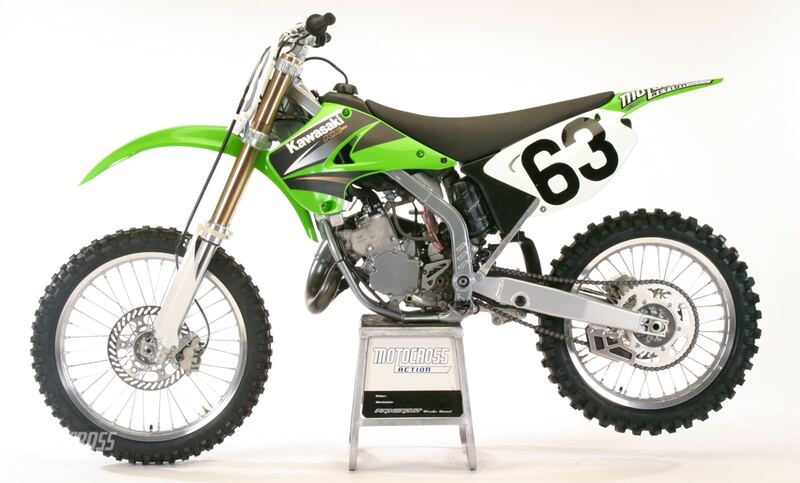 The 2004 KX125 engine produced three more ponies than the 2003 engine. It was a huge improvement. Factory 125’s, like the one that James Stewart rides, make a lot more than 35 horses, so for a stocker to hit that number isn’t out of the realm of possibility. But, the only other stock two-stroke in that range is the KTM 125SX. Q: HOW DID KAWASAKI PULL 35 HORSEPOWER OUT OF THEIR HAT? 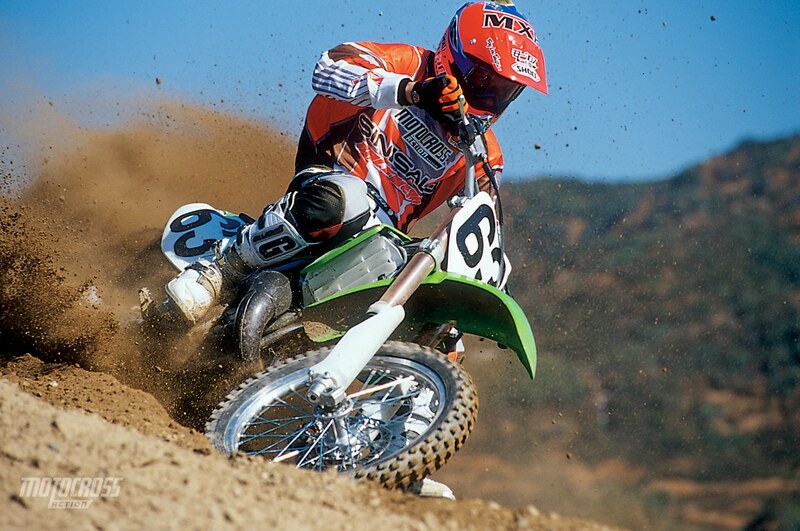 A: They made seven changes to the 2004 KX125: (1) The compression was raised. For 2004 it’s 8.5 to 11.1:1. More compression typically means more power. (2) The exhaust port was reshaped to improve overall flow. (3) The gap between the power valves was reduced for better sealing, especially when the valves are in the fully closed position at the exhaust port. (4) The exhaust pipe is all-new from the head pipe back. (5) Internal pressure on the piston ring has been reduced to lessen friction and allow for a freer rev. (6) The carburetor’s air intake manifold is shorter and straighter. (7) The angle of the reeds was changed from 90 degrees to 45 degrees and the reeds themselves are shorter and a secondary stepped reed is used for auxiliary boost. Q: WHAT IS THE BIGGEST CONTRIBUTOR TO THE KX’S POWER ENHANCEMENT? A: The pipe accounts for the biggest chunk of the power gain, but engine dynamics are a cooperative effort. Every little mod has to work in conjunction with the next. Kawasaki obviously got it right. Q: IS IT A DYNO QUEEN OR DUKE OF DIRT? A: It is very good. Given that we were overly optimistic after the dyno runs, it would be hard for any engine to live up to the hype. 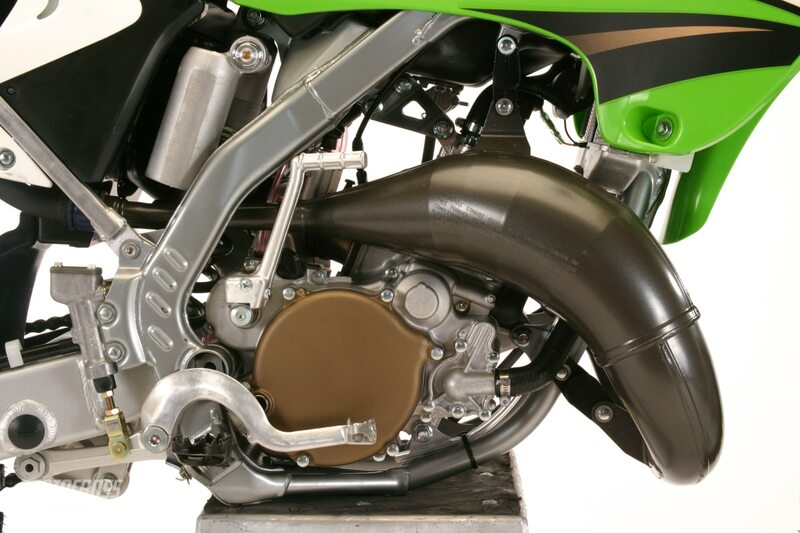 The KX125 powerband is exactly where you would want a 125 to be. It makes good power down low and then really starts pulling through the middle (and revs out far enough to get you to the next corner). The 2004 KX125 powerband is exactly where you would want a 125 to be. It did have a few weird traits. (1) Every test rider felt that the engine revved slowly. It didn’t want to scream. It growled in a deep roar. (2) Given it’s horsepower advantage over the RM125 and YZ125 (which make 33 horsepower on the same dyno), the KX125 didn’t seem to have a leg up on them. It didn’t give any ground, it just didn’t display a two horsepower advantage over its weaker opponents (conversely, the 34.5 horsepower KTM 125SX did). Queen or Duke? It’s a push, but it is a better engine than last year and gives up nothing to its red, yellow and blue competition in the dirt. Q: IS THERE ANY ADVANTAGE TO BE FOUND IN A GEARING CHANGE? A: Yes, but with a caveat. 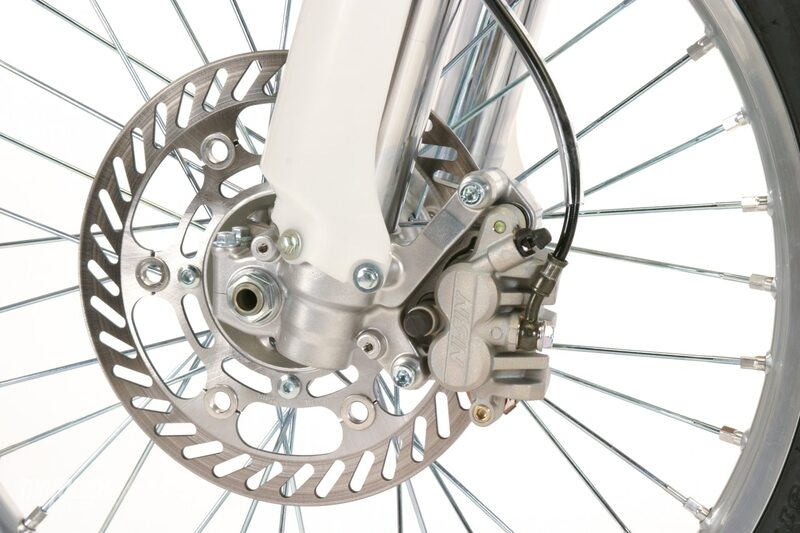 Intermediates and Pros can get away with the stock gearing. But Novices and Beginners will definitely need to add a tooth. In all honesty, Intermediates and Pros should try one tooth on the rear also — especially on tight tracks. The extra tooth takes the work out of keeping the revs in the meat of the powerband (and bike out of first gear). Novices and Beginners will definitely need to add a tooth in the rear. Q: WHAT ABOUT THE KAYABA SUSPENSION? A: Off the showroom floor it feels very unbalanced. The first test rider was back in the pits after one lap to stabilize the front/rear bias. In stock trim the 2004 KX125 has a nasty stinkbug feel. The front rides low and the rear is really high. Forks: Surprisingly, the low rider front end has nothing to do with the fork springs. We liked the spring rates, valving or clicker settings. The culprit? 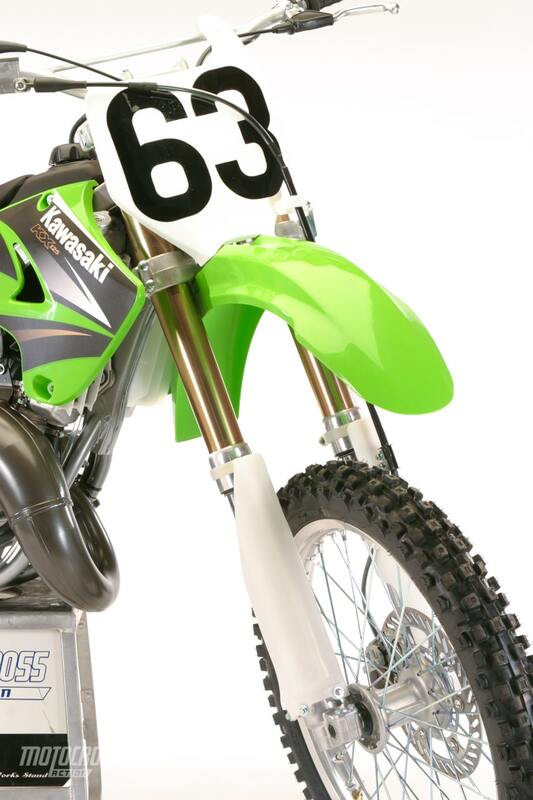 For some reason Kawasaki specs their bikes with the fork tubes slid way up in the top triple clamps. We’re talking freakishly high. We slid them down until only 5mm of fork leg protruded above the triple clamp. This was a quick and free fix. As we said, we liked the fork set-up. The stock compression and rebound clicker settings are in the ballpark for most riders, although faster or heavier riders will need to turn the compression in a couple of clicks. If you are light do the opposite. 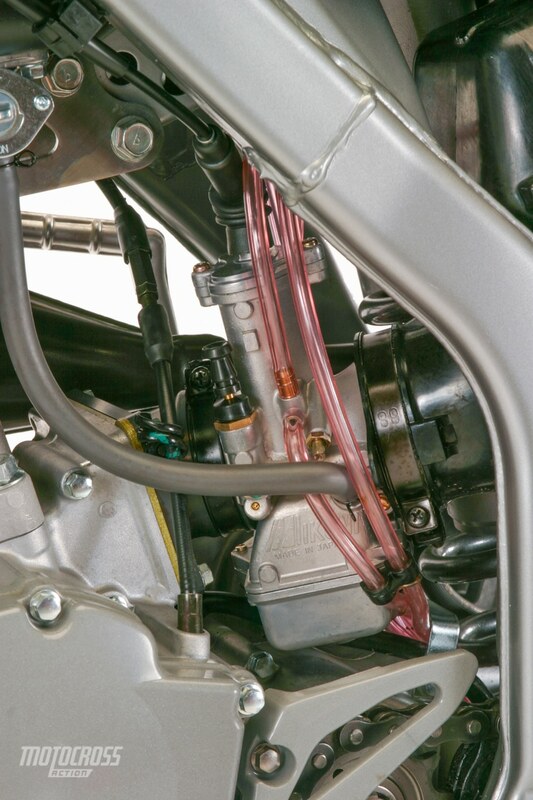 Shock: Yamaha-style rear shock linkage is en vogue for 2004. Both Suzuki and Kawasaki have adopted the Yamaha method of mounting the linkage to the swingarm instead of the frame. 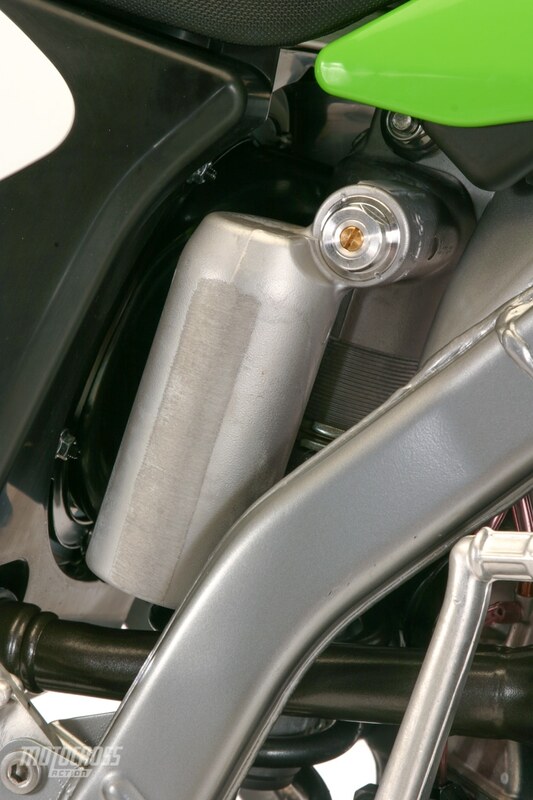 The new mounting location reduces thrust loads on the frame and shock and allows Kawasaki to us a 20mm longer shock and 17mm longer swingarm. 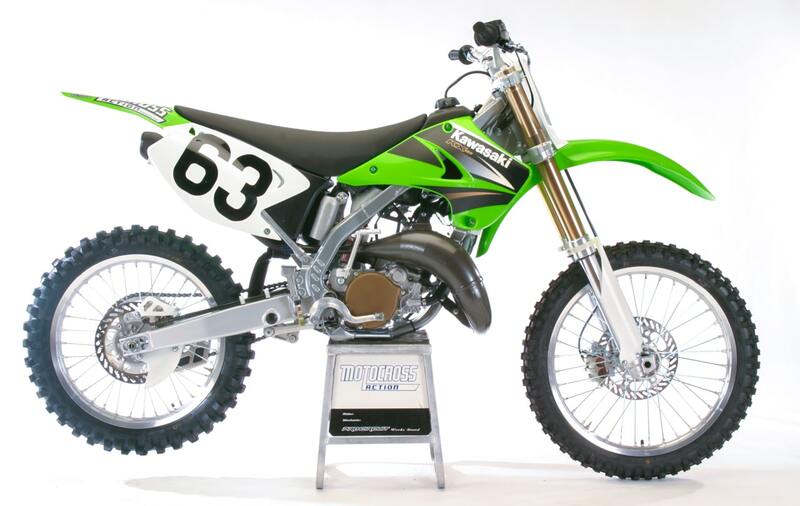 The longer swingram is not all that new; the Pro Circuit team has used the longer KX250 swingarm on their 125 National bikes for several years. How does it feel? Stiff, with its 4.9 kg/mm shock spring the KX125 rear shock will be able to handle riders in the 200-pound range. At first we were tempted to toss the shock spring in favor of something softer, but something told us that the shock was over damped, not over sprung (at least or our test rider’s weight). What was our solution? We lowered the race sag to 102mm to drop the shock a little farther into its stroke. And, then we began to progressively do laps and turn the compression clicker as we went. We stopped when the shock stopped kicking. The magic number for us was 14 clicks out on compression. (1) Balance: We hope that your friendly local Kawasaki dealer will rectify the fork height problems on the showroom floor. If he doesn’t you can fix the feel with a 10mm T-handle. (2) Handlebars: KTM’s and Honda’s aluminum bars make the KX’s steel bars look archaic. Are you listening Yamaha and Suzuki? (3) Shock: If you are a mini transplant, pushing 125 pounds soaking wet, you are going to find the rear of the KX too stiff. You will have to punt it to a suspension shop. (4) Ergonomics: Maybe it’s just us, but the KX125’s ergonomics are best suited to jockeys. This is the Seabiscuit of motocross ergos. (5) Clutch perch: What, no quick-adjust? No on-the-fly whirlygig? Everyone else has one. Why don’t they? (6) Gas tank: We don’t like black gas tanks. Never will. You can’t tell if it’s full until the ground is wet. (1) Power: The bike puts out some serious ponies and does it in a distinctive way. The extra power may not always come to the forefront, but its always there — working like an invisible hand to urge the KX on. 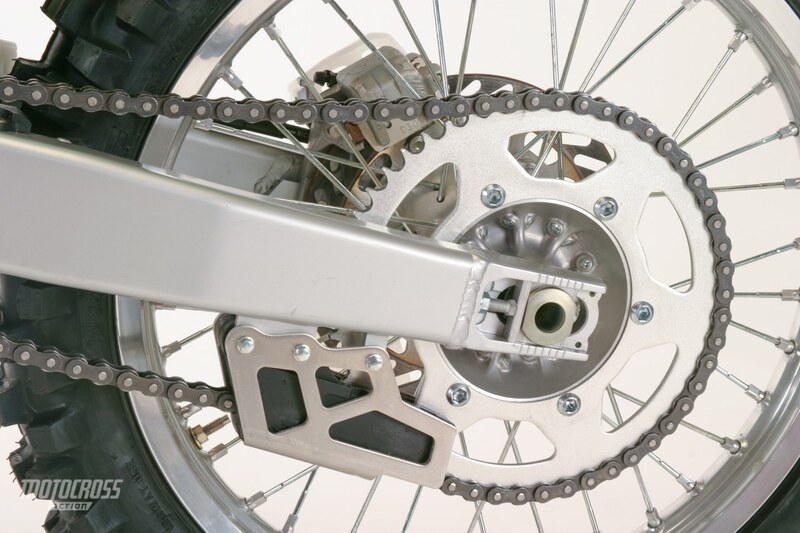 (2) Front brake: Honda front brake patent is up and Kawasaki has Honda-style brake line routing and a more powerful brake because of it. (3) Triple clamp: It took a long time for Kawasaki to put a rubber-mounted triple clamp on their 125, but they did and with its two-bar positions we love it. A: Last year the MXA wrecking crew discounted the Kawasaki KX125. We denigrated it by calling it “YZ125-lite.” No more. For 2004 the KX125 will not take a back seat to anyone in the horsepower department. This is not the “Lite” version of a 125. It’s got a full figure at last. FLASHBACK FRIDAY | TRAVIS PASTRANA WINS HIS FIRST EVER 125 NATIONAL!